WORDS WITH ARKY SHEA – AM I THE ONLY ONE THAT HASN’T FALLEN IN LOVE WITH THE AAF? I felt like I was just like any other football crazed maniac when the season was about to start for this new league. I love football. I love having more football with what was promised to be more hitting and less intrusion from the boring aspects of the game. I was ready to love. But we’ve concluded week three of the inaugural AAF campaign and I have noticed one thing that is far different from what I was expecting before this season, I don’t think I love it. I don’t think I am in love with more football for the sake of more football. It’s weird and believe me I’m just as shocked as anyone who could be reading this right now. I can’t figure out what it is completely because I do enjoy aspects of what I am seeing. I like the heightened anticipation of each play because there is less time in between them. I like the Eye in the Sky referee as a concept. I even like listening to those replay officials in the replay booth because it’s something that we’ve never had before, truly inside access to a very controversial part of the game but what I don’t like is the most important aspect, the game. I guess in the back of my mind I always knew that what we were dealing with was not exactly the most elite of football talent. True, the best of the best play in the NFL but these guys were close to if not already in the NFL and based on pure talent and experience these guys are better than my beloved college football players so what gives? I probably wanted more star power and truthfully I never really was going to get that because when you look at the stars of this league we are essentially looking at guys I’ve never heard of or had vaguely heard of or to be frank heard of mainly because they weren’t good enough to play with the big league. Part of the allure was the idea of second chances but with the “stars” of the AAF like Trent Richardson and Christian Hackenberg, they did have second and third chances and for me to believe those would translate further is a bridge too far for me at this point. So then I started to look at it from a more realistic standpoint. What is the AAF? Essentially it is just minor league football with players that were good in college, but not not in the NFL. Just below the most elite talent all working toward the same goal of either getting into the NFL or continuing their dream of not having to have a real job which is great because that’s minor league baseball and minor league hockey and the G League for the NBA. The difference in those and the AAF is that this was supposed to curb my appetite for more good football on TV and for me it just hasn’t been. It could also be that I really like basketball college and pro and that I have allowed myself to move out to new sports and that after the Super Bowl I was OK with there being a finality to football. 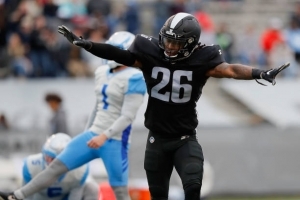 I’ve written this blog post with a lot of “I don’t knows” and “I am not sures” and “maybes” because I am still evolving these feelings towards the AAF. I never picked a team. I never picked colors or particular players to follow. All I did was just try to watch minor-league football. I do think the AAF is actually great for what it is and I absolutely would pay my hard-earned money to go watch in-person just like I would go watch the Rocket City Trash Pandas when they come to town but for TV purposes, it’s not going to be my thing or at least not yet.